Things are going well onboard the R/V Point Sur as we finish up the first leg of the CONCORDE fall research expedition (www.con-corde.org). Although the water column has been well mixed from the recent windy conditions, we are seeing a lot of structure with regards to the biology. 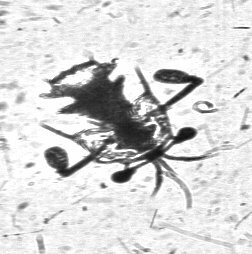 As we move along the transects, we see distinct changes in the plankton community. Here are just a few examples of the types of organisms we are seeing. This looks like something out of an alien movie, but it actually a stomatopod larva. Stomatopods are also known as mantis shrimps and, like many ocean animals, have egg and larval stages in the plankton. Adult stomatopods can give one of the most powerful strikes of any animal for its size. They use their club-like appendages seen in the image to bash their prey, stunning or killing it before consumption. Stomatopods, with their large compound eyes, also have some of the best visual acuity for any invertebrate. 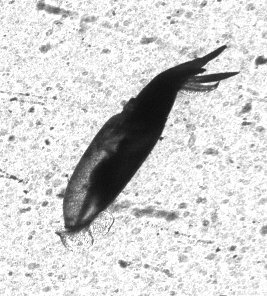 Today we also found this larval squid (~1 cm in size). 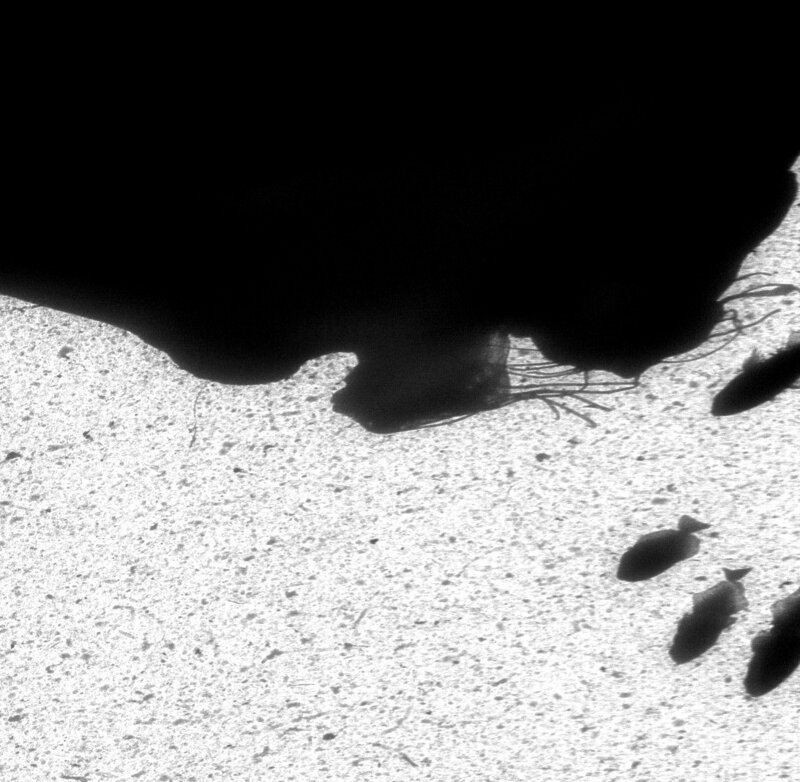 It was imaged right next to two similarly sized squid larvae, so we can only assume that they were spawned from the same parents or spawning event (i.e., they are members of the same cohort). Many larval animals may aggregate in this fashion to protect themselves from predators. Even though aggregating together may not reduce each individual’s chance of encountering a predator, the schooling behavior probably has a benefit because predators may become confused by the many potential targets in close proximity. This last image is one that is truly exceptional. It shows a large scyphomedusa (jellyfish) that covers almost the entire image. The field of view on the ISIIS is about 13 cm, and we can estimate that this individual is at least twice that size. It is likely a moon jelly (Aurelia spp. ), but the most remarkable thing are the fish larvae aggregating underneath it. We can see four larvae that appear to be jacks or butterfish that seem to be using the moon jelly for shelter or protection. Jellyfish are often thought of as predators of fish larvae, but images like this one show that that interpretation may be a bit simplistic. A few types of fish larvae are known to use jellyfish for protection because some larval fish predators avoid eating jellyfish due to their stinging nematocysts and low nutritional value. It is extremely rare to document this kind of behavior, especially the large number of larvae aggregating under one moon jelly. Incredible images. The hammers on the “alien ” are impressive weapons. The squid larvae are interesting as well. Capturing the rare photo of the jellyfish with the fish larvae questions the predator myth and opens a possible protector role. Thanks for sharing. Great finds! I was always curious how a baby squid would look like in image made by ISIIS! 🙂 The stomatopod reminds me of a crustacean (or its moult?) we have found in the MED data a few times. I was wondering what are those two club-like appendages for.. Thanks for sharing. Looking forward to the next post.